Turf & Dirt - On Horse Racing: A "Sinner" amongst us...Top 25 Derby Contenders & Connections! A "Sinner" amongst us...Top 25 Derby Contenders & Connections! Okay, it's a new month, and a new "Word". 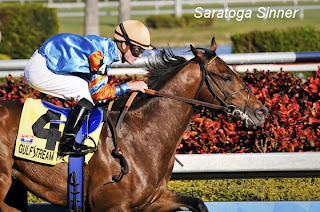 Saratoga Sinner debuts at #10, and what is a "Pamplemouse" anyway? Stardom Bound makes the list at #7, you can believe IEAH will run her. Beethoven drops a bunch, after an atypical Calvin Bo-rail trip in the Holy Bull...He'll be back. Shafted and Poltergeist make the list. 1 OLD FASHIONED Unbridled's Song Larry Jones Rick Porter Ramon Dominguez 2/16 OP Southwest S.
2 SQUARE EDDIE Smart Strike Doug O'Neill Paul Reddam Rafael Bejarano 2/16 OP Southwest S.
11 THE PAMPLEMOUSSE Kafwain Julio Canani Bienstock & Winner Stable, A. Solis II Alex Solis 2/28 SA Sham S.